So this build has taken me much longer than I expected but with my son starting his build as well I was not wanting to rush. Picked up a tank in October and the wife made me remodel my living room before I could build it. Well the room is pretty much finished now it's time for the tank then I can button down the rest of the room. Low profile overflow from eBay. I just finished the piping and leak test today. Everything works my only concern is the gurgling on the durso pipe. Maybe I have it to deep in my sump? Pics coming. Any help or input would be very helpful. Any ideas to reduce the random gurgling/ purge? Is it in the sump? I had a similar issue with the full siphon line on restarts. I had the pipe from the siphon line going very deep into the sump and I then cut it shorter and made the cut at 45 degrees so the short end of the 45 was just below the water line. This what was suggested to me a couple of years ago by someone on this board and now it works perfectly. So rather than cut the pipe I tried fiddling with the durso height today and the hole size on the end cap. I made it bigger which made it worse. 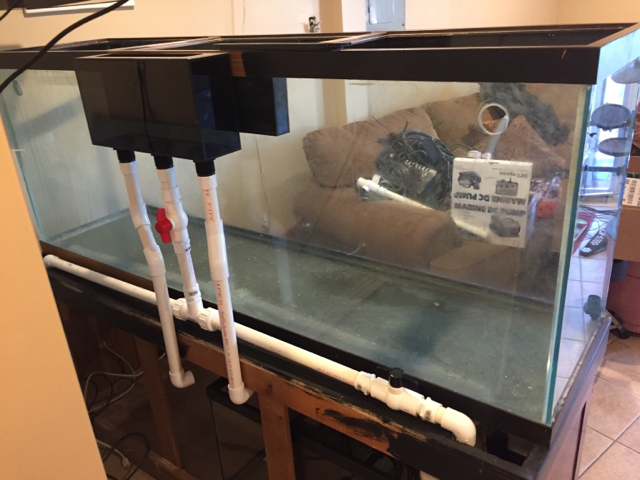 I raised the water level in the overflow box and raised the height of the durso. 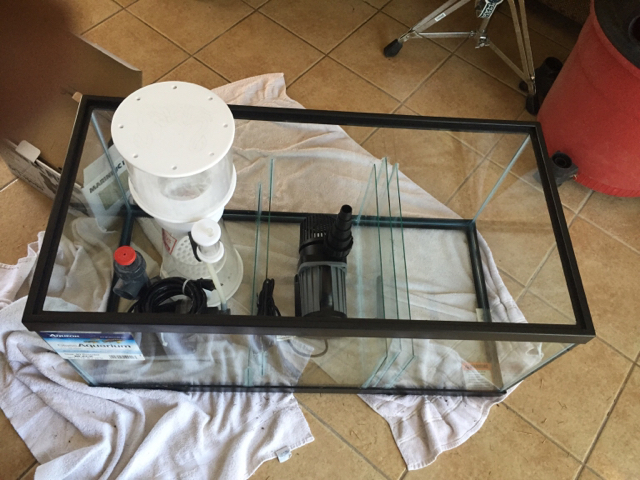 Now I have a lot less water going down the durso into the refugium which is what I was looking for along with no more random gurgling. Now I need to just find a way to silence the internal portion of the overflow. Thanks for your help I appreciate it. Cutting the pipe was my next step. Full syphon wasn't the problem it is 1" below the water line. It was the durso bubbles and gurgle. Thanks for all your replies and help as always. Thanks platehead for the dry rock. And Dong as well. 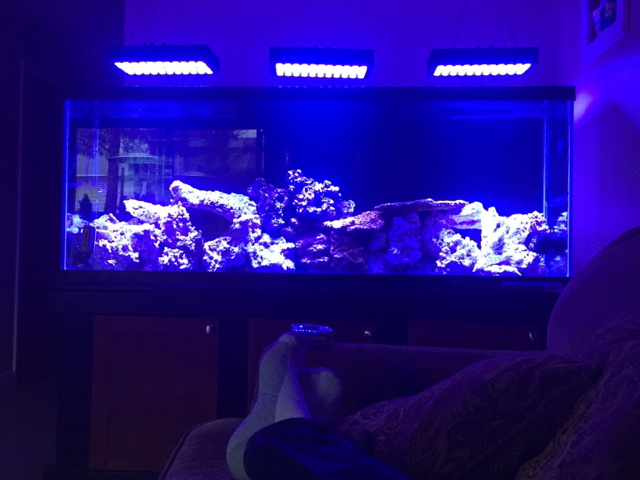 As usual I stopped by his house for some live rock and ended up with frags and a light lol. I'm pretty happy so far with the aquascape but always open to critiques/help. I decided to go bb for now and later if I want sand it's easier to add than take out. Really like your sump design. Question - if you forgo sand, are you putting the rock on the bottom glass? I guess I add sand to cover the plastic lattice stuff that my rock sits on. If I ever went bare bottom, I know I would freak about the possiblity of dropping a rock on the bottom and cracking the glass. No idea if that is a really concern or just my worst fears coming to life. Second comment, and being annoying critical, is that I would add a mountain somewhere to break up the levelness of the rock line. If you have a peak somewhere, it will also allow you to have coral placement after different heights which may help with corals of varying light needs. I'm the last person ever to give advice on rock work, but agree an off center peak would be nice addition. Imo good call on no egg crate. another random thought which I wish I had done. when you get that top layer of rock set(ish), maybe try taking out a few of the small pieces and drilling holes the size of a frag plug in them. For me, I just completely set up my rock work over the last month. I also got about 20 frags - some with frag mounts and some were fresh cut. All fresh cut were mounted to rocks big enough to hold the frag but not get moved around by snails. Once I found a good location, I used a little reef putty to ensure that the snails wouldn't push them off a cliff. Frag plugs were more difficult to place. I ended up taking a few rock pieces that were 6x6 and drilling holes in the corners to fit the plug point. With this smaller rock in hand, I put that on top of the formation. I also did the same with some smaller 3x3 rocks that hold 1 frag each. Just an update pic. Just started kalc dosing nothing new really. Thinking of adding more rock soon. Just got back after being gone for almost 2 years. Tank had to be 100% restarted. The quest begins again now.